Hopefully my readers are well versed in the history of Left Lane Cruiser, being as their last three releases have been reviewed on these pages. They're an interesting duo from Fort Wayne, IN that's recently turned trio, but that's really neither here nor there. As far as I know, this album just features the duo, but don't hold me to that. 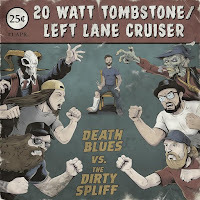 On their side, we see Left Lane Cruiser at their dirtiest, nastiest, and most conventional bluesiest. (If that last bit is a thing.) Freddie is pumping out some snarling, growling, slide guitar. This tracks feature some of the best licks he's ever committed to record. Left Lane Cruiser is a safe space. We always know what kind of sound we'll get from them and they did not disappoint. 20 Watt Tombstone filled up side B. Their tunes are totally new to me, but they're fun to follow on twitter. It takes all of 23 seconds to figure out why these two recording a split EP together makes sense. These bands both play some dirty blues. Dirty blues are always the most fun. 20 Watt separates themselves with a very different style of vocals, a bit more melodic and mellow. Side B will have your feet stomping as much as Side A, though in a bit more of a subdued fashion. From top to bottom, all six tracks on this split are winners.